Thomas Carlyle wrote, “A dandy is a clothes wearing man, a man whose trade, office and existence consists in the wearing of clothes.”1 Perhaps Carlyle, in his single most difficult and at the same time profound work, was by no means disparaging. After all Carlyle’s book, the title of which means “tailor retailored” presents an entire philosophy of clothes. The Oxford English Dictionary conjectures that the word “dandy” may be a shortening of the word “jack-a-dandy”, in use between the 16th and 18th centuries, whereby “dandy” in the 18th century meant exquisite, swell. North Americans are familiar with the word in the ditty “Yankee Doodle”. The OED says a dandy is “one who studies above everything to dress elegantly and fashionably”. 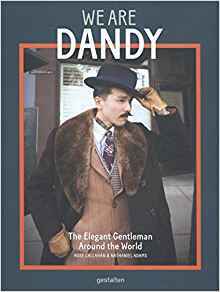 Rose Callahan (photographer) and Nathaniel Adams (author) have published their second study of this phenomenon, We are Dandy: The Elegant Gentleman Around the World, as a “global survey of men’s style and elegance”. However, this is an uncommon book. Yes, it has coffee table format, like many fashion books and museum catalogues, but it is neither. If one were to be confronted with this volume in any one of the few serious bookstores whose selection is not dictated by chain store or talk show fads, one might be surprised, but only just. The classic men’s style books are devoted to the history or the publicity of the upper class men and their mannequins of the second half of the 20th century.2 They can be said—for all their advice—to be guides of how to dress and act like the white men who have been responsible for so much carnage, misery and economic mayhem, what made and keeps that class so wealthy and powerful. Thus the style icon of the “American Century” is the late3 US Secretary of State, Dean Acheson, with his “typical New England understatement”, earning him a reputation among his British cousins as America’s best-dressed diplomat. Of course, the violence he promoted, like helping put the US in control of South Korea at the cost of at least three million Korean lives, is not what comes to mind when one sees photographs of him in his “Ivy League” look. The occasional ridiculousness of Pitti Uomo, so easy to rip on for a hip resident of New York, London or Paris, takes on a new significance when seen through the eyes of an aspiring dandy from somewhere less famous for fashion, like (South) Africa or Namibia. To these men, Pitti Uomo and all its attendant self-promotion and Instagramming, is a chance to feel connected to a larger cultural fraternity—a global movement. Their first book, I am Dandy, was an attempt to grasp dandyism as a cultural phenomenon.7 Their second volume arose from the realisation that the dandy may have its roots in Europe’s sartorial history but can no longer be viewed as purely European. That is what makes this book not only entertaining—which books have a right to be—but immensely relevant. If and when there is writing about Africa, it is usually depicted as a place without food, let alone clothes. The standard fare for the literate comprises reports by so-called humanitarian relief organisations or official “news” and information, about which wars are being fought, by whom over what plunder (e.g. diamonds, oil, coltan, etc.) is to be extracted from the still quite “dark” continent.8 A modest number of sincere scholars and literary talents manage to get attention in the “quality media”. Given that European and American relations to Africa go back more that 500 years, it ought to be extremely embarrassing how little coverage the 40-odd countries there get. We originally had a long list of cities in Africa: Lagos, Nigeria; Brazzaville, Congo; Windhoek, Namibia; Luanda, Angola; Johannesburg, South Africa. In the end we settled on Johannesburg, which is a continental fashion hub, and, because of the history of apartheid, a fascinating place to look at generational differences, race relations, economic inequality and their resulting effects on dandyism. Eight of the 56 dandy profiles are of men from Southern Africa. One profile is of a dandy from Cameroon and another of a Trinidadian living in the US. Fifteen are from Asia. That leaves just over half (31) to the Europeans and North Americans. Since dandyism stems from Europe this allocation is not illogical. Although there are several who have good jobs, often as art or design directors in the fashion or allied fields, the majority are not connected with the menswear business at all. They have ordinary occupations ranging from small shop owners or clerks to cooks and restaurant operators. Of course, there are artists and a few writers, too. But statesmen, CEOs and fashion-conscious billionaires have been carefully overlooked. What distinguishes these working and middle class gentlemen is not how much they can afford but that their interest in attire disposes them to spend whatever they have on clothes, rather than cars or other “manly” pursuits. Although each man profiled enjoys a certain local notoriety at home; none is a fashion grandee. In Africa people don’t understand. I’m from a Third World country and I want to prove to people that there’s more behind fashion. I want them to see that it’s not just about people spending money and being luxurious—there’s history to be learned, there is a benefit to style and getting dressed, and fashion is important both for economic and cultural reasons. Africa has potential and resources they can use. My dream is to make an impact on fashion with African culture. Male adornment has blossomed in part because of the cultural shift toward personal expression and individuality that took place in the latter third of the twentieth century. During the 1950s, the typical businessman literally hid behind his grey flannel suit. The era’s political climate mandated conservatism and uniformity. By contrast the cultural iconography of African independence struggles is relatively unknown or ignored. One has to recall that during Nelson Mandela’s 27-year imprisonment it was unlawful to publish his photograph in the South African media.15 The same applied to anyone subject to a “banning order”. Patrice Lumumba was brutally murdered as a young man and his body was never recovered. Steve Biko was murdered in custody of the apartheid-regime’s SAP.16 Malcolm X and Martin Luther King were both murdered by the age of 40!17 The one revolutionary style icon of the era to survive Andy Warhol’s portraiture was Mao. It is all too easy to dismiss style and clothing from serious political discussion. However, since the French Revolution made powdered wigs and knee breeches politically inappropriate and the woman’s movement retired the crinoline there has always been a shift in clothing style to accompany any major challenge to the political status quo. The return of the flat-top haircut and many other military style elements of the “white” 1940s and 1950s is probably no coincidence given the ideological swing to the right since Margaret Thatcher and Ronald Reagan set the fashion. It is a serious mistake to ignore or trivialise the prevailing fashion or style trends. If they do not help predict, they certainly provide indicators of where a society is or in which direction it may be moving. We are Dandy is not a revolutionary book. However, we are not in revolutionary times. Callahan and Adams have produced a beautiful book that draws attention to individuals in the extreme. The men shown in these pages are nonetheless endowed with historical consciousness and at least suspicion of the contemporary aesthetic. Some even aspire to challenge—to the extent individuals can—the questionable values and attitudes they see as detrimental, not for nostalgia but human dignity. In the absence of an environment conducive to classical political organisation, the responses to the destructive forces of our age have been increasingly isolated despite, or perhaps aggravated by, the illusions of digital media. On the one hand these dandies became more visible by virtue of socialising media. On the other they are all members of living communities. They live in real neighbourhoods where they are taken seriously. Mr Vusi Kunene is a competitor in “Swenkas”, a South African sartorial subculture in which working class men dress in flamboyant suits and engage in competitive pose-offs for prizes. The code of the swenka is almost a religion, you’re not allowed to drink or smoke in front of the swenkas; no weed. This enables us to become role models. We have self-respect and dignity. Through clothes we achieve status in society. Call it eccentricity. Or better than that, call it sincerity. The characters depicted in We are Dandy are not cynics. They are focused on the culture and history in which their lives are anchored. If their concerns appear superficial rather than those of great revolutionaries, they still cannot be relegated to the ranks of reactionary followers. They are in the tradition of the Romantics to whom we owe many of the constructive changes in the human condition.18 Maybe some of these dandies are the revolutionaries of our time. They live and convince by example—a very traditional way to affect change. Ernest Hemingway—who witnessed and wrote about much of the revolutionary fervour of the 20th century—once wrote “We have come out of the time when obedience, the acceptance of discipline, intelligent courage and resolution, were most important, into that more difficult time when it is a person’s duty to understand the world rather than simply fight for it.”19 The desire to understand the world has certainly become a form of dandyism today. This article was posted on Friday, July 7th, 2017 at 4:50pm and is filed under Africa, Book Review, Culture, History, Italy.